The sale table at Brave New Worlds in Philadelphia is always a good time. It regularly challenges me to walk away empty handed. The times I lose, I still win, because I pick up something like Marvel 1602 by Neil Gaiman and Andy Kubert. It was an eight issue mini-series from 2003 that, because of its format, was enabled a degree of freedom other stories don’t get. For starters, we don’t have to worry about the impact of a given arc – the whole project is a single, self-contained entity. This is the same reason it can send us centuries back in time and not be obligated to explaining every little detail as to how the characters came to be. Marvel 1602 uses a moment in time to magnify a couple perspectives. One is the power of an historical mystique. Readers may or may not know a ton about the 17th century, but they certainly know that people of the time didn’t have the knowledge we do. It’s peculiar to us that someone could believe in conspiratorial witchcraft, and in a way that makes readers want to know more. We find it’s James VI of Scotland, eventually James I of England, the very man for whom Shakespeare wrote Macbeth because of his obsession with the supernatural, who wants those with extraordinary “abilities” in this universe executed, and it’s almost like we want to see him hunched over the side of his chair, pointing his finger with a confidence only the fearful can. The case of James VI serves as an example that’s easy to look at because he so much time has passed and he isn’t living. It’s easier to be objective when zooming out. What seems to have driven James VI’s actions historically is a perverse combination of paranoia and what his environment enabled. 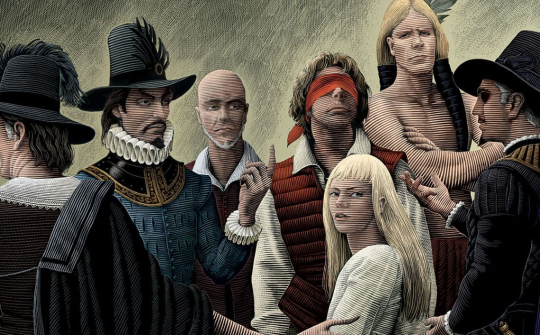 What seems to drive it in Marvel 1602 is more power driven, but nonetheless there’s an undertow of curiosity that sweeps you into the sea of the plot. The undertow doesn’t limit itself to just the history of King James, though. It plucks major characters from the Marvel universe and redubs them. Charles Xavier is Carolus Javier. Nick Fury is Sir Nicholas Fury. Peter Parker is Peter Parquagh, and so on. These small variations of well established and loved characters come together and present the idea that history is prone to repeating even the most exceptional moments and people. As I read it made me wonder how many times the noteworthy experiences and people I’ve encountered have strolled around some part of the earth. Not in the literal sense, mind you, but their type. It’s like all the information we could want is out there if we can realize – not find – the way to see it. 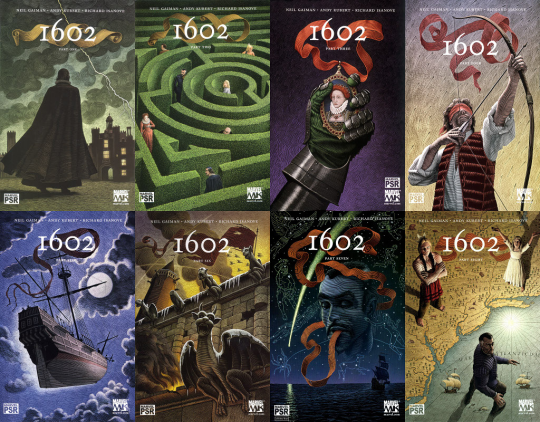 Marvel 1602 does what a mini-series does best by putting its arm around you and taking you for a ride without worrying about the steps that had to be taken to get to your front door. Instead of focusing on an origin it’s more concerned about what’s immediately in front of its characters and emphasizing why their story is being told, enabling an easy trip that exercises the brain. It’s what comics are supposed to be: fun.